We have completed the design of our embedded (stereo and mono) camera with highly efficient FPGA onboard processing. In stereo mode, the whole processing pipeline fits into entry level FPGA devices without additional hardware requirements delivering accurate and dense depth map in real-time. The imaging sensors, connected to the FPGA board with a standard interface, provide color and monochrome images up to 60 fps. Further details and videos will be available soon. If you are looking for rectified stereo sequences follow this link. S. Mattoccia, M. Viti, F. Ries, "Near real-time Fast Bilateral Stereo on the GPU"
S. Mattoccia, "Accurate dense stereo by constraining local consistency on superpixels"
S. Mattoccia, "Fast locally consistent dense stereo on multicore"
S. Mattoccia, "Improving the accuracy of fast dense stereo correspondence algorithms by enforcing local consistency of disparity fields"
S. Mattoccia, "A locally global approach to stereo correspondence"
S. Mattoccia, S. Giardino, A. Gambini, "Accurate and efficient cost aggregation strategy for stereo correspondence based on approximated joint bilateral filtering"
F. Tombari, S. Mattoccia, L. Di Stefano, E. Addimanda,“Near real-time stereo based on effective cost aggregation"
Software (Show Support) is available at the same location. F. Tombari,S. Mattoccia,L. 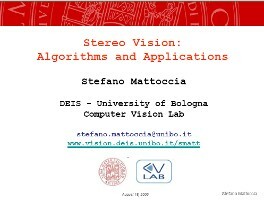 Di Stefano, E. Addimanda, “Classification and evaluation of cost aggregation methods for stereo correspondence"
S. Mattoccia, F. Tombari, L. Di Stefano,“Stereo vision enabling precise border localization within a scanline optimization framework"
F. Tombari, S. Mattoccia,L. Di Stefano, "Segmentation-based adaptive support for accurate stereo correspondence"
In the same page you may find also rectified stereo sequences and disparity maps computed with the SMP algorithm. COPYRIGHT NOTICE:This material is presented to ensure timely dissemination of scholarly and technical work. Copyright and all rights therein are retained by authors or by other copyright holders. All persons copying this information are expected to adhere to the terms and constraints invoked by each author's copyright. In most cases, these works may not be reposted without the explicit permission of the copyright holder.